I started reading Tom Fidgen’s blog, The Unplugged Woodshop, back in 2008. For more than a year, I followed him as he progressed through the various stages of his projects, impressed with his writing style, rejoicing in the occasional philosophical thought that made me look at the mundane from a different point of view, and fully delighted with his carefully thought out words and the incredible photography accompanying each entry. So, when he announced he was in the process of writing a book, called Made By Hand, I couldn’t wait to get my own hands on it. And then, a bit later, when he said he was taking pre-orders, I was one of the first to sign up. If it was anything like his blog writing, I knew it would be well worth the money. 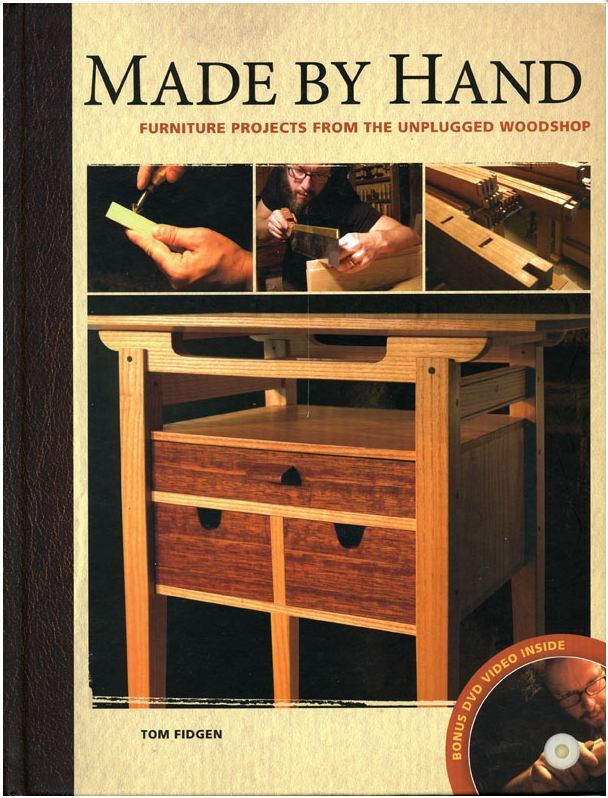 Finally, in November of 2009, my copy of Made By Hand arrived in the mail and I immediately dove in. Right out of the box, I was impressed with what Tom had put together. I really prefer the 8.5”x11” format in a woodworking book, which is what Tom used, and I’ll pick a hard-bound book over a soft-bound copy of the same book any day of the week. The paper is high quality and low gloss, and the simple serif font is set on an off-white background, so the pages are easy to turn and easy on the eyes. Anyone who has enjoyed one of James Krenov’s books will find the familiarity of the front cover quite pleasing – certainly Tom is influenced by Mr. Krenov in more than just his project design. My experience with real honest-to-God artists, time and time again, has shown that their artistic talents are not limited to just one medium. Tom once again proves that theory with his book. He is not just a great woodworker; on the credits page, you will see him listed as the photographer. And the photography is indeed of the highest quality – each picture is framed just right, with an artist’s eye, to properly portray the intended message without so much clutter. So far this book was living up to every one of my expectations. Finally, I got to the content of the book. It is broken down into two basic parts. The first part is a section of three chapters that cover the essentials of what basic tools you should have in your shop, useful workbench appliances, and detailed information on some hand tool techniques. The second section contains design ideas and a walk-through for six projects. While, for the most part, the writing was fairly clear and the sequence well-organized, it was not the same writing I was used to seeing in his blog. Oddly enough, it seemed more casual than his blog writing ever was, with incomplete and poorly structured sentences throughout. Maybe it was a result of time constraints with the writing or, more likely, the editing. Or maybe Tom was trying to be creative in order to avoid the dull and humdrum content one finds in so many books on woodworking. Whatever the case, I felt it needed a bit more work. Overall, I was fairly pleased with the end result, but, personally, I would be happier with a second (edited) edition. As you can see by the publishing and receiving dates of this book, it took me a while to write this review. I post it with some trepidation; I do not want to sound overtly critical (indeed, I hope the review is taken constructively and not hurtfully) but I feel I shouldn’t review only things I have just good things to say about. Those would end up being quite boring reviews, would they not? I don’t mean to take anything from Tom’s woodworking skills – from what I’ve seen (and I’ve been following Tom’s blog for most of four years now), it is all fantastic work. Honestly, I know he is an incredible writer, too! This book just doesn’t showcase it. I too followed the blog posts leading up to the books publishing and enjoyed them very much. I haven’t read the book yet, but plan to read it soon. I just haven’t been doing that kind of furniture work lately, and have been focused on other things. Taken as a whole, there is a lot to like about the book. The dimensions are pleasing, it has good figuring to it, and the colors are quite complimentary. I just think I could still see some tear-out through the finish in a few places. A couple sessions with a finely adjusted smoothing plane would have done it wonders. Oh, and I forgot to mention the DVD that came inside the back cover! It was a great companion to the first section of the book, giving visual aid to the topics and tools discussed. The video and sound quality was high and Tom has a really good on-camera presence. It definitely helped lessen my disappointment in the technical content issues. Adda-boy…you tell it like it is! Love that stuff! I looked for your email address regarding the eggbeater and couldn’t find one and as I refuse to do reverse tracking, I’m stuck unless you slip by my blog and pick up my email address. While you are there, you can read the reply comment I left you. It would be great to see some photos of your shop, especially after going to all that work keeping it green. Get in touch, we can compare tartans. Yes, shop photos! Totally going to do those. Errr… the flooring is probably totally and completely acclimated to its environs at this point, so I’m definitely going to have to find the time to get it installed. Man, if only I could buy some of THAT at a garage sale, right? Then I’ll definitely take some pictures of it for the community at large. Can even do a side-by-side of the horrid purple room before the four coats of paint (yeah… apparently they painted unprimed concrete and drywall). Tartan in the header is Ancient Campbell, by the way. Married into the family, but I still feel the need to *hock-spit* on the golden arches every time I drive one of those MacDonalds places. I’m way late on this, but I just discovered the blog. I also found that Tom’s editor(s) let him down quite badly. Not only were there grammatical errors but inconsistent spellings, e.g., bridle joint and bridal joint. I wrote an email to Tom about this shortly after reading the book, and he said it was good timing because he was meeting with the publisher to consider a 2nd edition. I hope that works out for him. I too do editing of technical writing and I found these errors to be quite distracting. I’ve been fairly unhappy with the contemporary woodworker’s opposition to “constructive criticism” for some time now. People feel if they aren’t doing something full-time, for pay, then they don’t have any authority to tell someone else they’re doing it wrong. It IS possible to provide positive encouragement and STILL point out obvious (or not-so-obvious) flaws in design or technique (or, in this case, editing/writing) and make suggestions for improvement. If nobody is willing to point out the mistakes, then growth for the woodworker happens much more slowly. One thing I want to try and encourage through my blog (maybe I’ll make that a focused return topic to hit upon every so often) is the idea that we need this kind of feedback to make us better woodworkers. After I finish a project, I always sit down and write out a critical self-review of it, trying to figure out what I liked about it, what techniques worked and didn’t work, where I need to improve, determine what mistakes I could have prevented, etc. This has always been a very personal thing I do in one of my woodworking notebooks, but I think I’ve done this for one or two boxes in blog-form. It’s time to start putting more of this kind of writing out “there” for others to see.